The sheer elegance of black and white wedding invitations is unrivaled. 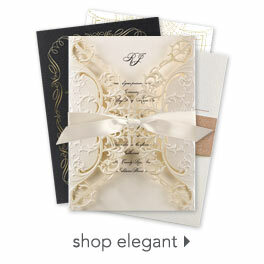 These classic wedding invites introduce your event with the utmost class and sophistication. Whether you're having a casual soirée or a formal affair, guests will know you settle for nothing less than the best. Let Invitations by Dawn help you find the perfect design to fit your personalities and wedding style. Not confident in your color choice? Order a sample so you can see the color and feel the quality.